When performing in a stage version of a well-known TV classic there are two things to consider – firstly do the audience expect the performers to be look alike mimics of the original TV cast and secondly continuity of a stage production is often limited compared with a televised version. In these respects, STARS managed to reach a much appreciated compromise with players looking fairly similar to their TV counterparts with also the similarities of mannerism and personalities of well-loved characters. Carol Keen, playing the title role of the Vicar, gave a sterling performance as the somewhat exuberant, chocolate loving Geraldine Grainger and she was the glue that held the production together. Her opposite protagonist was Jonathan Clamp as the insular and somewhat domineering David Horton, leader of the parish council – a role that Jonathan excelled in. 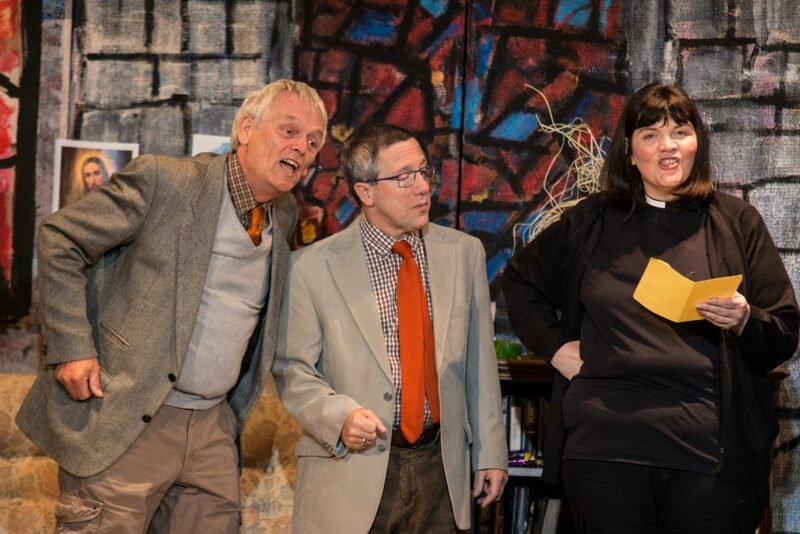 The parish council of misfits with the pedantic parish clerk Frank Pickle (Ellis Leatherbarrow), culinary catastrophe Letitia Cropley (Caroline Robinson), dithering Jim Trott (Tony Middleton) and foul mouthed farmer Owen Newitt (Bob White) each were well suited to their respective roles causing much hilarity and laugh out loud moments from the capacity audience. Of course the burgeoning love affair between the ‘simple souls’ of Hugo Horton (David Cadman) and verger Alice Tinkler (Sheilagh May) was a highlight as they figuratively ‘danced around’ each other until they finally kiss – possibly the longest kiss of all time – well done guys! The need to have two distinct playing areas of the vicars lounge and the parish meeting room can often lead to delays but the split set utilising a thrust to the stage mostly eliminated the delays and pace was for the most part maintained and nicely ‘filled’ by appropriate music between changes. All characters softened a little in the second half showing their respective compromises to each other and the wedding scene was a ‘hoot’ with Teletubby bridesmaids and ushers Ellie and Katie McLeish, Sophie Turver, Josh Ashton and Tia Lunn-Tyson (one of whom was missing on the night I saw the production) being interrupted by a random ‘woman’ (Mireille Edgeworth) as she objected to the wrong wedding. The set was well crafted and designed (especially the vicars living room), costumes well worn, lighting was more than ample and voice projection from the players enough to reach the back of the hall. The audience loved it (especially the cliff hanger ‘Bread of Heaven’ epilogue) and to be perfectly honest – so did I….